If you ever offer this setup for 70 and up I would be in for one for my AMX. Thanks. The Kit for my 69 arrived today, top notch! Didn't expect it, but it was even a installation manual included. Hey, it made it all the way to Sweden, glad to hear! 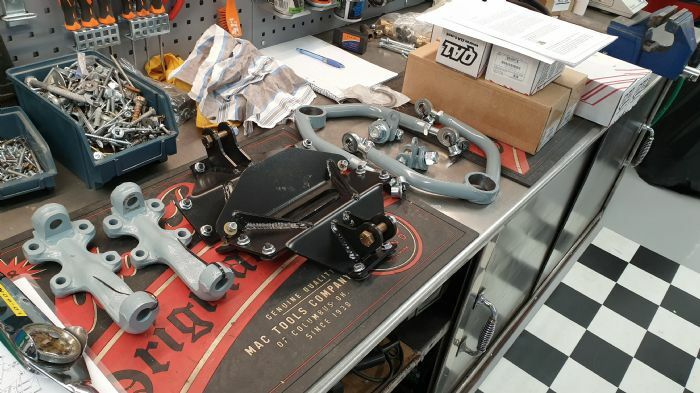 I am intrested in the suspension kit you have fabricated and would like to know more about it. Sorry I didn't see this post before I bought everything to redo mine stock. Definitely looking to get one of these kits for my new project. Hopefully there are still kits being made. I'm still plugging away on kits, I was all caught up in January, for a few days. Now I'm behind again. Getting 4 kits out this week, and just working down my wait-list. I'm doing most of the work on these so I can to keep cost down, but I do have limited time, so my apologies for those waiting. Response has been very strong, so thanks to everyone who has ordered a kit. Below is a car that's going over to the U.K. with my suspension on it and lots of other updates too. Nothing better than a car after some serious testing!